Least terns (Sternula antillarum) are small water birds that nest along the Missouri and Mississippi Rivers and some of their tributaries, as well as coastal areas in the U.S. Monitoring the species began after the U.S. interior population of least terns was federally listed as an endangered species in 1985. 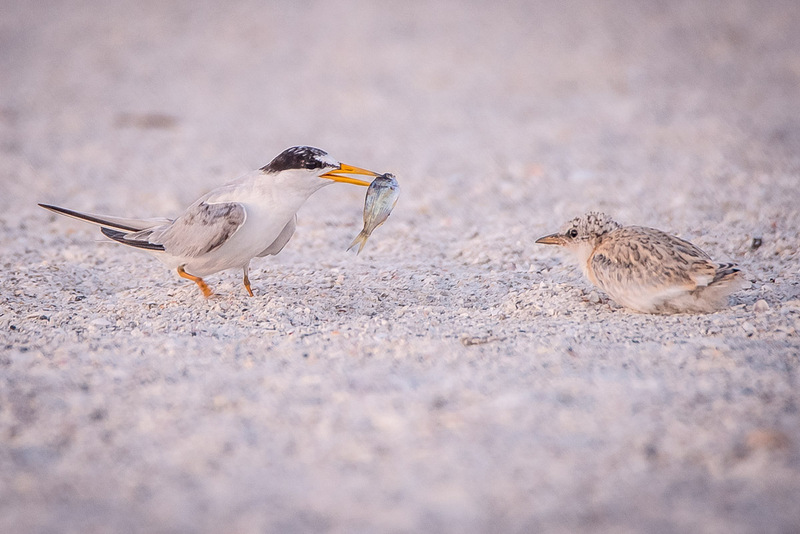 Least tern parent feeding its young. Photo by John Hartung, Art That Smiles. “In the Missouri River basin, least terns were impacted when natural sandbars and habitat connectivity were lost due to development of large dams and reservoirs,” says USDA Forest Service scientist Monica Schwalbach, lead author of a recent study that sheds light on the birds’ capacity to adapt to changes in their environment. Least terns periodically require high water flows that restore sandbar habitat, but high water during the nesting season can wipe out nests and young chicks. Schwalbach, now an assistant director with SRS, conducted surveys on the Cheyenne River in South Dakota over a 29-year period. 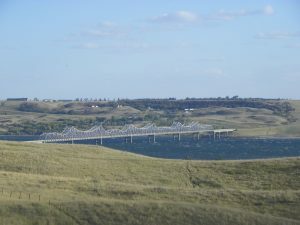 She used this information to evaluate the relationship of this small population with the least tern population nesting along adjacent Oahe Reservoir on the Missouri River. Schwalbach and research collaborators wanted to know if birds on the river and reservoir might move between the two areas in response to fluctuating water levels. As it turns out, they likely do. The findings are based on adult bird counts and water level data on the river and reservoir, from 1986 to 2014, and point to important relationships among reservoir water levels. When water levels were higher on the reservoir early in the breeding season, there were fewer birds on the reservoir and more birds on the river. The most birds were observed on the reservoir when water levels were lowest there. Results were recently published in the journal Waterbirds. 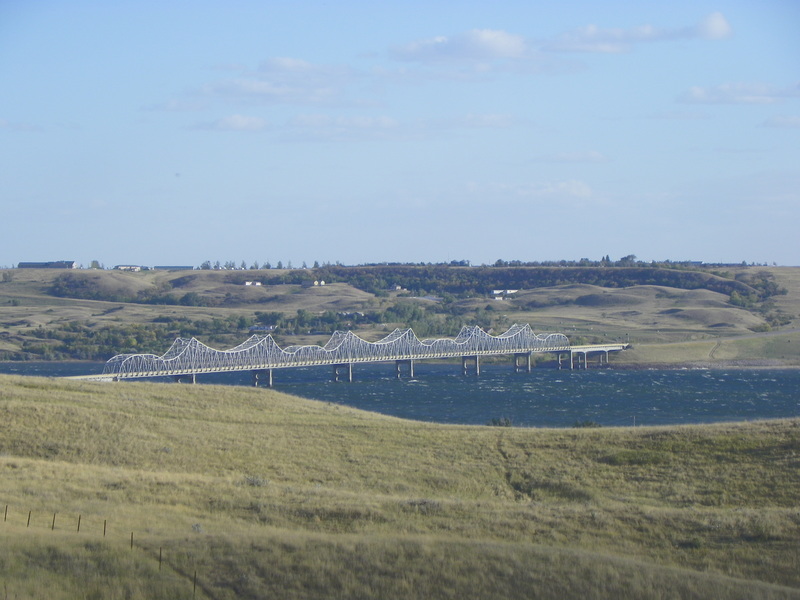 The Oahe Reservoir extends from central South Dakota into North Dakota. Small colonies of least terns nest along its shoreline. Photo by J. Stephen Conn. Researchers note that monitoring of individual birds with banding or tracking devices would confirm this. Researchers were encouraged by the birds’ movement to more suitable habitat in response to water levels early in the nesting season, but also detected a gradual decline in total numbers of adult birds over the study period. 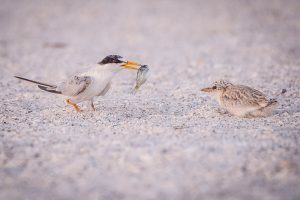 The study, especially if combined with more extensive monitoring, can help managers better understand the dynamics among least tern populations across the species range. Ecologist Lars Pomara and biological scientist William Christie from the Eastern Forest Environmental Threat Assessment Center and statistician Stanley Zarnoch co-authored the study. For more information, email Monica Schwalbach at mschwalbach@fs.fed.us.